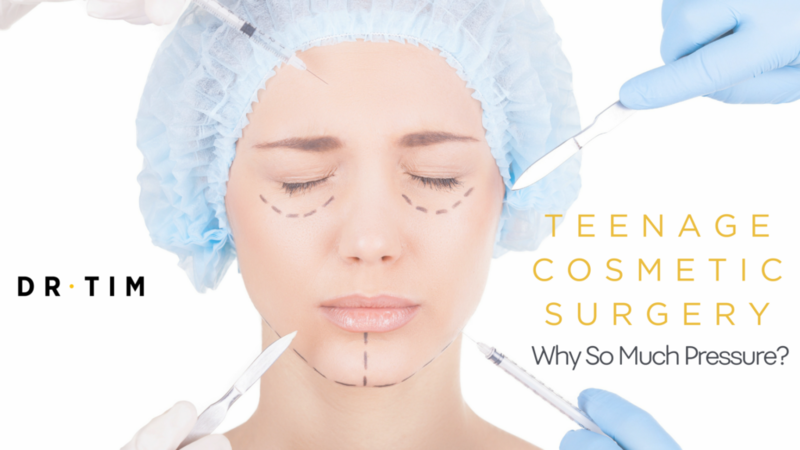 Teenage Cosmetic Surgery: Why So Much Pressure? There has been a storm brewing for some me now regarding teenage cosmetic surgery. A concoction made up of quick ﬁxes, a society obsessed with beauty, and the commercialisation and overexposure of cosmetic surgery. This has all lent themselves to the growth of cosmetic surgery for Generation X and younger. This has been further compounded by the increasing number of medical specialists entering the cosmetic arena. My worry is that this Generation X and their successors wanting teenage cosmetic surgery may become an abused marketplace. It would appear that they have it a little easier, in the sense that, they have parents or relatives who have had cosmetic surgery and are approving of it, in an economy that has been both buoyant and robust for some time now. This takes away from the fact, that teenage cosmetic surgery needs much more scrutiny because it can play on people’s insecurities and promises of an instantly better life. Most plastic surgeons I believe are responsible individuals with a conscience who try and counsel teenagers, usually in front of their parents, of the risks, beneﬁts, and outcomes of procedures, as well as whether they are appropriate or not. They try very hard to show that TV programs like Extreme Makeover, Dr. 90210 and The Swan trivialise and glamourise cosmetic surgery and that glossy magazines like Teen Vogue or Teen Cosmo display airbrushed photos of models and celebrities that are in reality unachievable. Now teenagers who want to have cosmetic surgery usually have diﬀerent motivations and goals than adults. They too have cosmetic surgery to improve physical characteristics they feel are awkward or ﬂawed, that if left uncorrected, may aﬀect them well into adulthood. Teens tend to have cosmetic surgery to ﬁt in with peers, to look similar. Adults tend to have cosmetic surgery to stand out from others. Teenagers frequently gain self-esteem and conﬁdence when their physical problems are corrected. In fact, successful teenage cosmetic surgery may reverse the social withdrawal that generally accompanies teenagers who feel diﬀerent. Not every teenager seeking cosmetic surgery is well suited for an operation. Teenagers must demonstrate emotional maturity and an understanding of the limitations of cosmetic surgery. The teenager initiates the request. The young person must appreciate both the beneﬁts and limitations of cosmetic surgery, avoiding unrealistic expectations about life changes that will occur as a result of the procedure. The teenager has realistic goals. While parental support isn’t lessened at all, the teenager’s own desire for cosmetic surgery must be clearly expressed and repeated over a period of time. The teenager has suﬃcient maturity. Teenagers must be able to tolerate the discomfort and temporary disﬁgurement of a surgical procedure. Cosmetic surgery is not recommended for teens who are prone to mood swings or erratic behavior, who are abusing drugs and/ or alcohol, or who are being treated for clinical depression or other mental illness. Cosmetic surgery may be performed on the nose to straighten the bridge, remove an unsightly hump, reshape the point or open breathing passages. Ordinarily, this is not performed until the nose reaches its adult size – about age 15 or 16 in girls and a year later in boys. The procedure accounted for nearly 50 percent of all cosmetic surgical procedures performed on this age group. Surgical correction of protruding ears, in which the ears are pinned back, may be performed any time after the age of ﬁve. Otoplasty made up 11 percent of all cosmetic surgical procedures performed on this age group. When one breast grows to a much larger size than the other, an operation may correct the diﬀerence by reducing the larger breast, augmenting the smaller, or both. Many teenagers who want breast augmentation tend to have one breast that is larger than the other – sometimes a full cup size or more in diﬀerence. This condition is called breast asymmetry. Using a breast implant in the smaller breast allows the patient to have breasts of the same size. Although waiting may prolong the physical awkwardness, it is advisable to delay surgery until breast growth ceases in order to achieve the best result. Breast implants can be used for breast augmentation in women 18-years or older and for breast reconstruction. Many teenagers who want breast augmentation to have one breast that is larger than the other -sometimes a full cup size or more in diﬀerence. This condition is called breast asymmetry. Using a breast implant in the smaller breast allows the patient to have breasts of the same size. Although waiting may prolong the physical awkwardness, it is advisable to delay surgery until breast growth ceases in order to achieve the best result. Surgical reduction of very large breasts can overcome both physical and psychological burdens for a teenage girl. In fact, many teenagers suﬀer ongoing back pain due to overly large breasts. Although waiting may prolong the psychological awkwardness, it is advisable to delay surgery until breast growth ceases in order to achieve the best result. Acne eruptions may be controlled by the proper use of modern prescription drugs. In addition to supervising the use of these medications, plastic surgeons may improve acne scars by smoothing or “reﬁnishing” the skin with a laser or with a ﬁne sanding technique called microdermabrasion. Other treatments for acne related skin problems include laser skin resurfacing, dermabrasion, and chemical peels. Teenage boys with large breasts, known as gynecomastia, are often eager to undergo plastic surgery. Surgical correction can be accomplished in a variety of ways including liposuction and/or surgical excision of the breast tissue. As a plastic surgeon, I am an advocate for the right teenage cosmetic surgery, at the right time, and for the right reason. Things like correction of prominent ears, breast reduction in adolescent boys or breast reconstruction in young girls with an underdeveloped breast can truly advance the person’s quality of life. It is our responsibility as plastic surgeons to guide teenagers (and their parents) in the right direction and to educate them that cosmetic surgery is not a panacea for the everyday pressures that teenagers’ face. Cosmetic surgery can make you more attractive but not necessarily happier! Question: What do you think is the commonest reason teenagers want cosmetic surgery? You can leave a comment below.